This mod is not the heavy lifting I am known for, but parenting has a way of subtly changing you. I thought this project might benefit someone that has purchased a Sniglar changing table and can no longer find a Gullunge changing pad that fits the top. We live in a small house and needed to keep our newborn in our room. We were stressed over this decision, but the Sniglar helped because of the small footprint. We paired this with a Fisher Price sleeper and our problems were solved, so we thought. 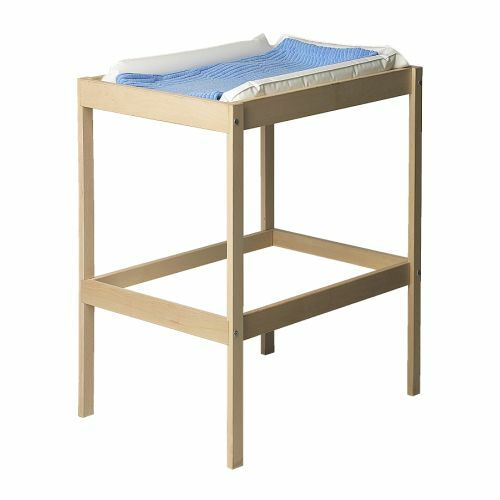 At the time of purchase, Ikea was not selling the Gullunge changing pad online. I sought one out, but found that they all had vanished, apparently a recall. This left us with an odd dimensioned table without a pad. The fleece pads are still nice to have on top of the custom pad so they can easily be swapped out in an inevitable emergency. My new son managed to put the pad to the test the second night. No need for explicit descriptions here. We also want to mention a must have accessory for 3:00 AM diaper changes. Energizer has a gooseneck, clip on LED light that is awesome. It is bright and manageable with one hand. Nice for the spouse sleeping in the same room. I know this is a very specific post, but it is a great solution for a unique problem. There have been several issues with the comments section hosted through blogger. I hopefully have this debugged. Sorry for any inconvenience, I love to hear the feedback, feel free to use the "Contact" link if there are any other problems. Thanks. I just came upon this same issue and have not been able to find a pad anywhere that fits this table. Off to Joann's right meow!